Preparing for the Arrival of 2017! *Our change to the nightly shots in 2015 had our fans going “Ooh! Aaah!” so this year we are going to continue shooting from the bluff three nights a week! On the nights that we are not shooting from atop Granddad’s, we will be shooting from Pettibone Park, right across the river from the giant light tree at the entrance to Rotary Lights! 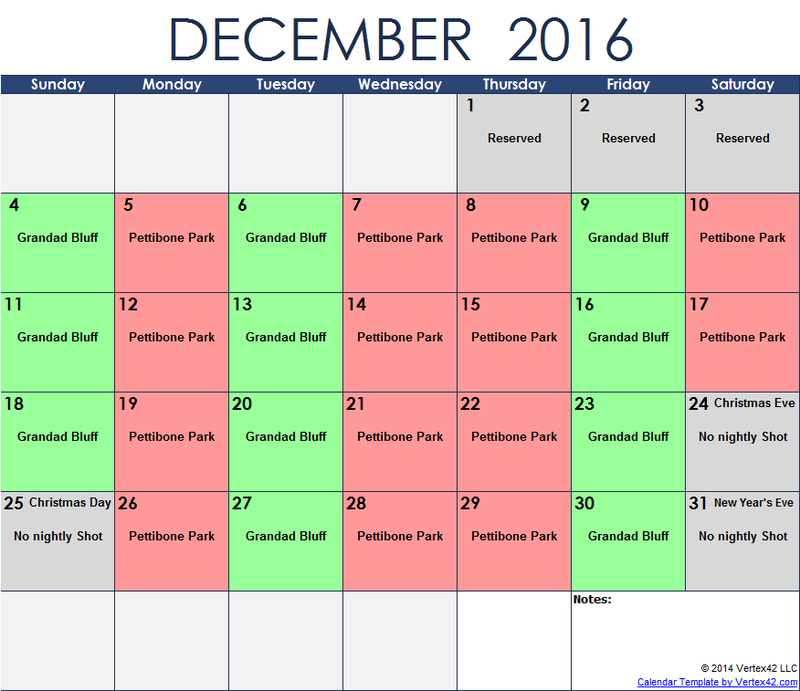 The below calendar shows which days we will be at either location; the rule of thumb is that we will be on the bluff on Tuesdays, Fridays, and Sundays; in Pettibone Park on Mondays, Wednesdays, Thursdays, and Saturdays. All shoot times will be at 6:00 pm. * Next, we would also like to mention our Open House! The sixth annual “Stuff the Mortars!” family open house and fundraiser will be held on Saturday, December 10th from 1pm to 4pm at the Myrick Park “Gun Club” shelter in La Crosse. We will have displays available to educate anyone interested on how fireworks “work,” refreshments, and even some demonstrations allowing people to have a chance to push the plunger and set off some pyrotechnics. If that is not enough to light your fuse, we will also have a chance for anyone who attends to sign up to win a nightly shot up on the bluff! For more information, feel free to drop us an e-mail at prdirector@skyrockers.org. We hope that everyone has a wonderful Thanksgiving, and we can’t wait to see you out at our events!